One of the surprises revealed during today’s Persona livestream was that Persona 4: Dancing All Night will be making its way to PlayStation 4. 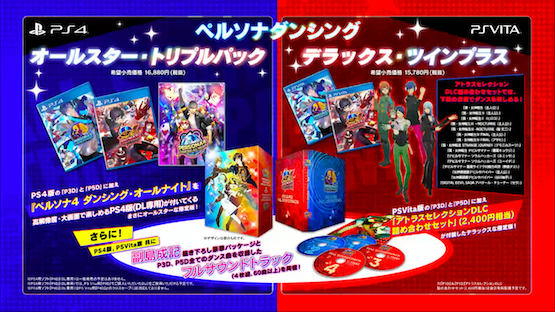 Currently, the game will only be available as a digital bonus to those that buy a special package that includes both Persona 5: Dancing Star Night and Persona 3: Dancing Moon Night. Plans can clearly change, though, especially since no North American release plans have been unveiled yet. All three of the games will release on May 24, 2018 in Japan. Aside from the music, Persona 4: Dancing All Night also looks great. The character models are all extremely well done and detailed, and the environments are colorful and exciting. It is really a perfect looking game for the Vita and it looks just as good when you hook it up through the PlayStation TV. The biggest gripe however I found with the environments is that sometimes they were too colorful and full of life, making it hard at times to time your notes, which are a light yellow color. As someone who isn’t the biggest fan of rhythm games, I was a bit timid when I first installed the game for review. However, my fears were quickly removed by one of the most intoxicating soundtracks around and possibly one of the greatest cast of characters assembled. Sure, the story wasn’t the best I have seen in a P4 universe, but it was still intriguing enough to push things along at a smooth pace. The gameplay is where things really shined however, as this game is just fun to play, and that’s what you want in a rhythm game. Fans of the series or not, Persona 4: Dancing All Night has all the right moves. Persona 4: Dancing All Night will release on PlayStation 4 on May 24, 2018.